The excellent Luc Besson Blu-ray series continues from Madman and this time it’s The Fifth Element’s turn to receive a well deserved Blu-ray makeover. 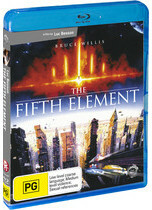 Originally released in 1997, The Fifth Element was director Luc Besson’s first mainstream science fiction film and I although I loathed this movie in the cinemas, something clicked with me several years later when I saw it on DVD. The DVD release was quite spectacular in its day but as the Joker from Tim Burton's original Batman said, "wait till they get a load of me", that was my first reaction when I saw it on Blu-ray... gorgeous, not just the female lead Milla Jovovich but also the spectacular quality on Blu-ray... hubba hubba indeed! After sitting down and watching this movie, I pondered to myself... een after all these years, The Fifth Element is still an ambitious and entertaining science fiction film that heavy features the Besson paintbrush in its creation, especially his artistic flair which shines with the wonder and an amazing almost 80's inspired colour palette. Interestingly enough, the story is quite campy and is reminiscent of more than one Star Trek films but it proved that Hollywood did not have the exclusive rights on science fiction films. Shock horror, people from other countries could as well and Besson proved the naysayers wrong. 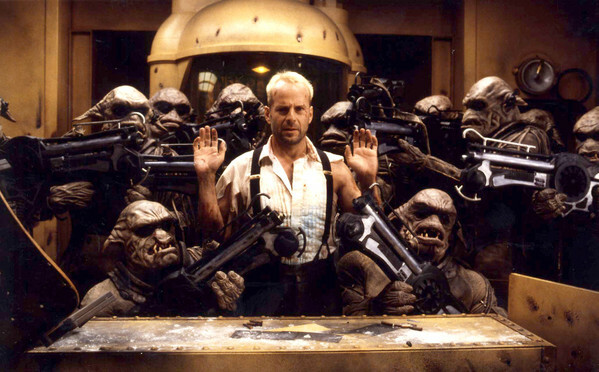 The story of The Fifth Element begins in 1914 where a race of aliens called the Mondoshawans have taken four elemental stones from Earth in order to prevent them from falling into the wrong hands. 300 years later, mankind has conquered the stars and the Mondoshawans are returning to Earth to stop a blight that threatens the very universe itself. Unfortunately they are destroyed by the Mangalores, a dog-like alien race and from the wreckage of the Mondoshawans ship, humanity uncovers the DNA elements of a human. Using advanced technology, they recreate this human that has been dubbed the “perfect being” by a group of monks who are also desperately trying to save her life in order for her to fulfil her destiny as mankind's savoir but to make matters worse, both the government and the Mangalores want her as well. The perfect being is called “Leeloo” (Milla Jovovich) who is forced to escape her captors and quite violently lands in the life of futuristic cabbie Korben Dallas (Bruce Willis) by crashing onto his flying car. We soon learn that Dallas was a former solider and is unwittingly drawn into this epic battle of aliens, lost artefacts and a perfect being who is the saviour for Earth and the fabled fifth element. The villain in The Fifth Element is played delightfully by Gary Oldman and really adds some much needed humour to this scoundrel who is really just a patsy for the big bad of the movie. Joining Willis, Jovovich and Oldman are Chris Tucker as DJ Ruby Rhod, one of the world’s most annoying characters (even to this day) and Ian Holm as Vito Cornelius, a monk who is trying his utmost to recruit Dallas to his cause which adds to the fast paced atmosphere of the movie. So why did I hate it the first time? Probably because I didn’t understand what the hell was going on but after the second, third and fourth sitting, The Fifth Element has become a favourite and really cemented itself in Pop Culture from its over the top colour palettes to some wonderful special effects that still look great today. The whacky story and wonderful characters also lends itself well to the story and although I've probably watched this movie five or so times, I loved it again. As opposed to the original DVD release which was quite grainy, The Fifth Element Blu-ray release by Madman boasts some amazing picture quality and really showcases the power of FULL HD. With vibrant colours, sharp picture quality and a minimal amount of grain, this is how good movies of today look, let alone a movie that is 13-years old. Add in a perfect audio track and this movie needs to be heard loud to be thoroughly enjoyed. Special features haven't been skimped on either and for both fans and newcomers, there are some great special features from the Making of the film to creating the special effects and of course the star element, Willis and Jovovich. Some special features are quite annoying to watch but thankfully on this release, they don't have a bunch of nerds preaching but down to Earth people who really enjoyed being part of something big. If you have never seen The Fifth Element before, I recommend that you at least rent the movie to see what all the fuss is about. Even if you scratched your head throughout the entire film, give it another sitting and before you know it, it’s like getting a call from god and everything suddenly makes sense. That’s the beauty of Luc Besson’s The Fifth Element, there is so much going on this movie that you do get distracted but once the story comes together, it’s like putting together the world’s hardest puzzle and with it comes the satisfaction!